One Mom, One Son, One Twizy Car in Paris … Nightmare on the Champs-Elysées! Let the adventure begin – ready for a Twiztour of Paris! You may have spotted some unusual cars zipping by on the streets of Paris recently. Was it a car? Was it a motorcycle? If it looked like a hybrid of the two, it might just have been a “Twizy” car. These electric cars are two-seated and have an automatic transmission, making them easy to drive if you’re not used to manual transmission (more common in France). A new company offers Twizy cars for rent in Paris, and you can choose from a number of different tours that you follow through the streets of Paris with the help of the GPS Audio Guide. Intrigued by this unique way to see Paris, we couldn’t resist the chance to take a Twizy out for a spin in Paris! Olivier was the brave driver. Brave in the sense that he calmly pulled out into the traffic of Paris with his mother in the back seat and after getting his driver’s license only last summer. It was a little stressful – for mom and son! Watch our Twiztour video here. Top Recommendation: Book a a Classic Car and Driver at a Great Price! Perfect family tour of Paris! Book a classic Citroen tour of Paris — with driver! If the idea of driving through Paris in a tiny car intimidates you, sit back, relax, and have a driver take you around in true French style. 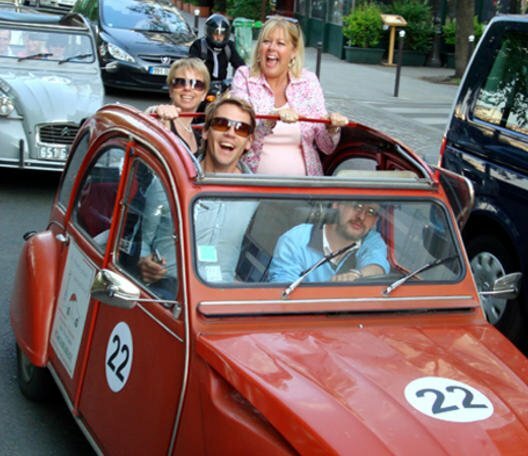 The Paris by 2CV Tour has refurbished these French classic cars and offer excellent French driver guides who will give you an unparalleled tour of the city. Best Way to See Paris — relax and let your driver take you around in a Classic Car!! Tours are offered in English with friendly drivers –they span a wide variety of offerings from the Left Bank to Montmartre and more. 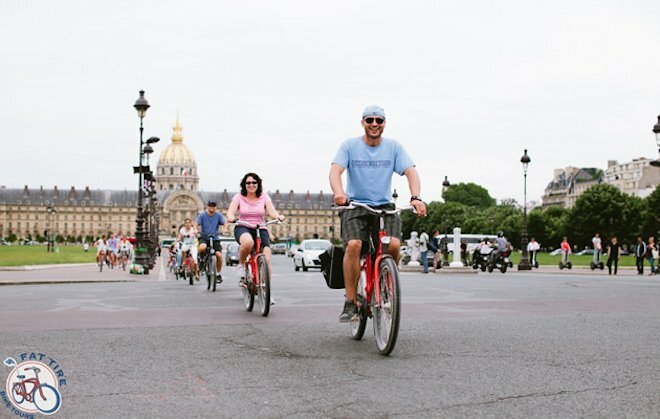 Enjoy a tour of Paris without worrying about driving! Midnight in Paris Tour – Romance with a Red Rose! If you’re searching for a romantic evening, you can stop now, because we have the perfect one planned for you – red rose and all. Or if you want to take the kids along for a day-tour, rent one of their four-seaters, pull the top down, and let the guide keep them entertained with cool facts about the city. Treat yourself or someone special with this uniquely French activity and email Lizani at [email protected]. NEXT: Old French Paperbacks – A Decorating Idea! Posted on Thursday, March 6th, 2014 at 12:49 pm in Paris Tours & Services. You can follow any responses to this entry through the RSS 2.0 feed. You can leave a response, or trackback from your own site. 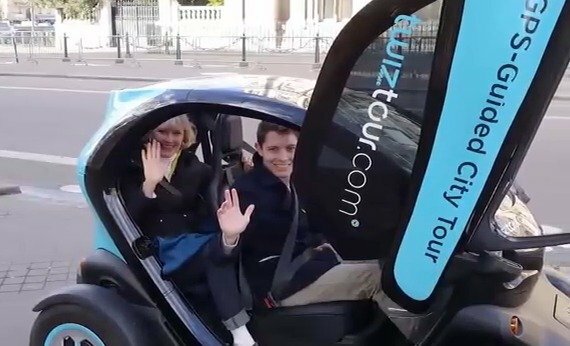 The answer was the “Twizy” car for driving around Paris for the missing entry. I Love Paris Perfect!! !